Nick Murico has his armor in place for a copyright battle. When the sun set on March 25, lightsaber-wielding warriors battled one another at the Bea Evenson fountain at Balboa Park. Each competitor tried to slash his/her way through the brackets, to try to win the Underground Lightsaber Fighters Gold Cup. 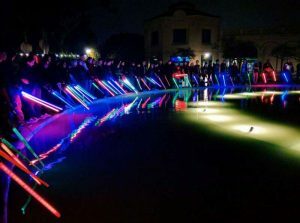 There were about 75 people present surrounding the sectioned-off “battle arena.” The judges sat on the elevated platform closer to the water, and awarded points to the one-on-one competitors. The first one to strike his or her opponent five clean times, won, and was one step closer to winning the title. Organizing and judging the lightsaber competition is the fun part for Murico, an East County resident, but he faces a lot more potential battles than other “combat sport” organizers. Lucasfilm and the Walt Disney Co. are both known to go after those that commit copyright infringement on their brands. This includes other lightsaber-based businesses. Last October, New York Jedi and Lightsaber Academy were sued by Lucasfilm. 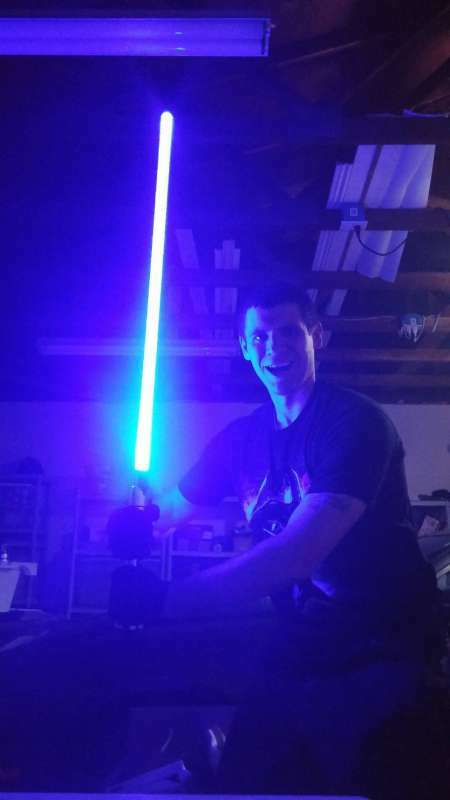 The East Coast companies taught lightsaber classes just like Murico does (at the LionHeart Academy in El Cajon). “But they (New York Jedi and Lightsaber Academy) kept going even after they were warned and hit with cease and desist orders,” Murico said. 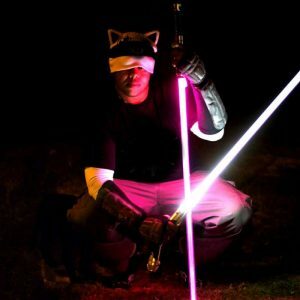 Murico is aware that because he is using the word “lightsaber” on his events and organization, he might be next. He said that he is prepared though, and he’s got his armor in place. Murico is already thinking ahead and has backup names that he cannot reveal. He has other options too. 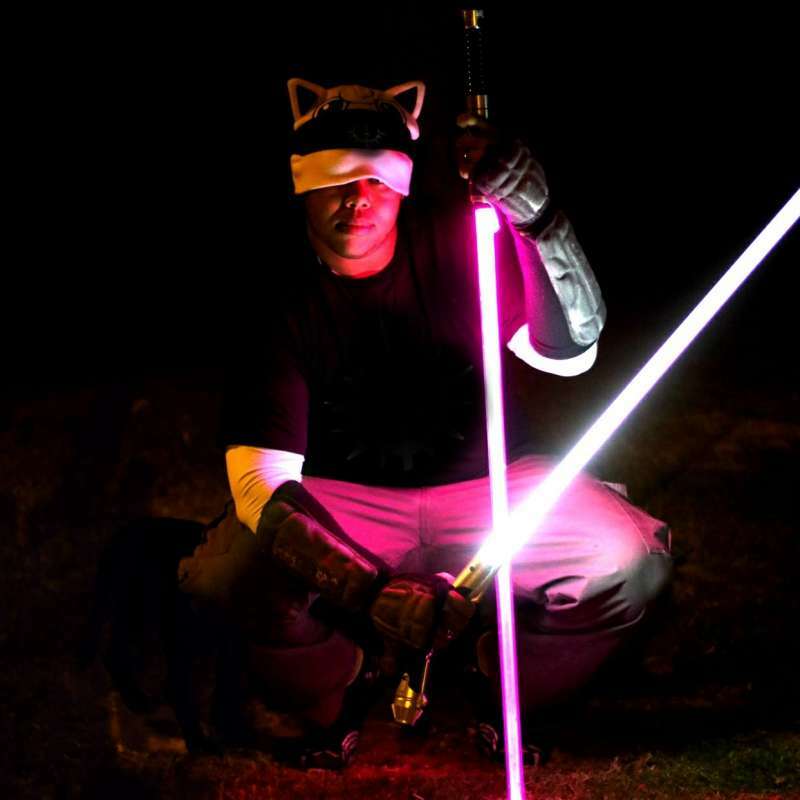 Murico defines his Underground Lightsaber Fighter (ULF) brand as a “method of operation” and said that it’s different than other lightsaber companies. It’s a meld of pop-culture and combat sport promoted via social media — “think of fencing with giant glow sticks,” said one of the purveyors at the tournament. Lightsabers were originally coined in the Star Wars movies. They were a laser shaped as a blade that would emit with a push of the button on the hilt (the bottom section of the sword) and in the movies, the fighters would use the lightsabers to cut through almost anything in its path (with the exception of another lightsaber). 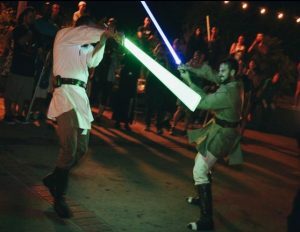 In simulated saber combat though, the faux lightsaber is mostly made of lit-up plastic, which still can sting with a good whack; which is why the ULF competitors wear protective gear. It is mandatory for a fighter that enters Murico’s tournament to use a mask, gloves and shoes. Knee pads, shin guards, a groin cup, and elbow, forearm, and torso protection are optional. Murico said that the ULF is the only place in San Diego where everyone can come and compete with a crowd to watch, and where prizes are offered to winners.